A swimming pool is created as a still water reserve device plus a pumping and filtration system. In other words that is to say when the pool is filled up, it should hold tight the water. However, there are more factors at work breaking this situation. Evaporation is one of the factors that will lead to water loss, especially if your pool is located outside where wind is blowing heavily throughout the year and you have no plan applying any kind of shelter system. BluwhaleTile in this post is going to introduce water leaking ways besides evaporation, such as water loss via the circulation system or the framework of the pool itself. Before moving forward to talk about other water leaking ways, something technical about evaporation is worth your concern as well. 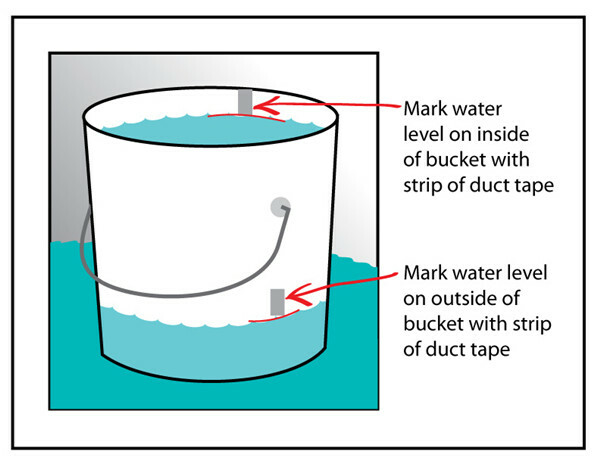 Using a transparent bucket or similar plastic container, place it on the pool stair or shelf so as to fill the container to the exact same water level with the surroundings. This method ensures water in the container have no difference with the temperature and chemical composition of the pool water. By the way, don’t use small-opening containers that will not go through the same wind blowing impact that your pool may have, carefully observe the water level as it vaporizes from your pool and the container under the same circumstance. Any distinction between the two water level is the volume you want to measure how much your pool lost externally. Before talking about other leaking ways, you need to be noticed that all swimming pools leak a bit because of design and construction factors. In fact, leaking problem is very universal to the function of a swimming pool. For instance, let’s assume the most excellent swimming pools on the earth are made of concrete. Most pool contractors think so, but some may hold divergent view so to be fair, possibly the most superior pools around the globe are composed of concrete. Concrete is, by character and structure, absorptive. Most concrete pools will be covered with a layer of waterproof material like plaster, and most of you think the solid plaster covered with blue water pool mosaics has verified to be extremely good at water conservation. However, this also possesses similar nature with concrete, absorptive as well. Don’t bother, this is a reasonable loss based on the structure of concrete pools. When maintained well and taken pool resurfacing regularly, the pool will lose merely little amounts of water thanks to the solid swimming pool coatings. In fact, there are more elements taking effect. 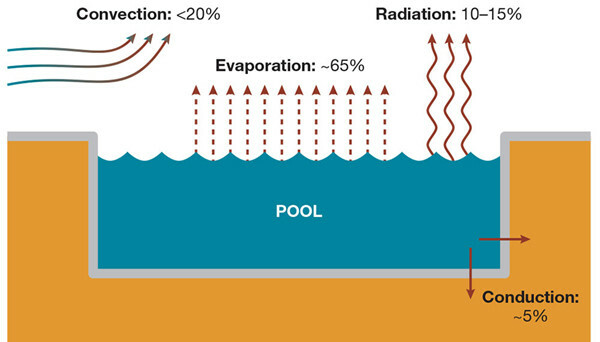 The building of concrete pools decides there will be a water loss theoretically acceptable. In reality, the structure of a concrete pool makes enough allowance for failure and flaw in the water retaining capacity of the pool covering. In this case, if water is allowed leaking within a proper range, how to know which kind of leak should be regarded as an issue? The bad news is that swimming pool leaks are often too hidden to be noticed so it is always occurred that when pool owners find the water loss, the problem has progressed out of control and needs emergent handling. Serious pool water leaking issue can bring many more new problems. A pool that appears losing water more quickly than evaporation alone need great concern of you and should resort to complete detection. 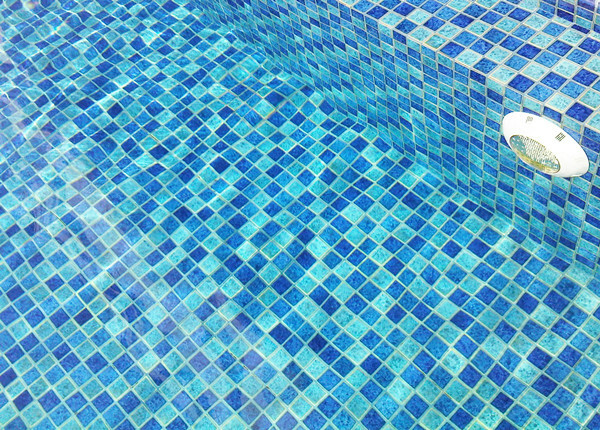 The ratio of water loss can serve as your best reference to know how serious the pool leaking is. Water level of a pool that goes down over two inches every week can be recognized as an unusual phenomenon. If two inches a day or more every few days, the problem might be more serious than you think and should require your most urgent attention. Pools carried out long-term waterline monitoring are possibly to have further trouble from the pervasive water, and any construction beside your pool, like a courtyard path, also can be damaged by the extending water above or under ground. If your pool leaks at a rate rapider than evaporation alone, you require to quicken leaking detection or ask for professional pool service to fix the leak. BluwhaleTile is a premium mosaic tile company launching series of swimming pool porcelain and glass mosaic tile collections, which can prevent water from penetrating and damage the structures nearby. Contact us TODAY at http://www.bluwhaletile.com for more product info and lowest quote.